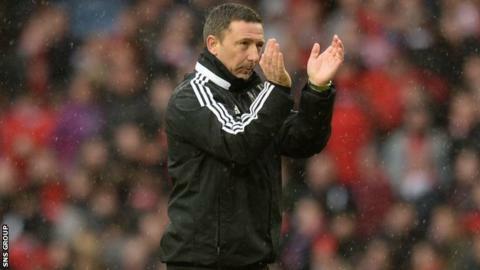 Aberdeen manager Derek McInnes aims to secure second place in the Premiership to complete an excellent campaign at the Pittodrie helm. McInnes is the Scottish Football Writers' Association pick for manager of the year, adding to his same award from PFA Scotland. "As a club, we have upped our game this season," he said. "We've managed to get into Europe and that's great. Now we need to accumulate a few more points for second spot." McInnes will receive his second high-profile managerial prize on Sunday evening following the Dons' two remaining matches; away to Dundee United and at home to Motherwell. Aberdeen hold a one-point advantage over the Steelmen, who host Inverness Caledonian Thistle on Wednesday. "Any award is really appreciated and, like any award, it's an indication of a collective team effort," said McInnes, who succeeded Craig Brown at the tail end of last season with Aberdeen in the bottom half of the top flight. "I'm delighted to accept it on behalf of everybody's efforts. The players and staff have worked extremely hard." McInnes led the Dons to their first trophy in 19 years by winning the League Cup in March, while dreams of a double were dashed by St Johnstone in the last four of the Scottish Cup. Aberdeen suffered their first league loss since February at Celtic on Saturday, going down 5-2 to the champions. "It was our first league defeat in quite a while," said McInnes. "And draws, which we have had quite a few of recently, won't always get the job done. "So it's game on for us. There are still matches to be won for us to be totally satisfied with our work this season. "We have two massive games coming up and I would rather have something to go for at this stage of the season that not - and we certainly have plenty to aim for."